Margaret of Austria: regent of the Netherlands, both Belgium and Holland, from 1507 until 1515 and 1519 until her death in 1530; was born 10 January 1480, a daughter of Emperor Maximilian I. After the death of her brother Philip I of Castile in 1506, her brother's Burgundian territories were inherited by his son, the future Emperor Charles V. Due to Charles' youth, Margaret was named as his guardian, and governed the Netherlands on her nephew's behalf. Margaret died 1 December 1530 and was succeeded by her niece Maria of Habsburg. Hoop Scheffer, Jacob Gijsbert de. Inventaris der Archiefstukken berustende bij de Vereenigde Doopsgezinde Gemeente to Amsterdam, 2 vols. Amsterdam: Uitgegeven en ten geschenke aangeboden door den Kerkeraad dier Gemeente, 1883-1884: v. I, No. 1b. Zijpp, Nanne van der and Richard D. Thiessen. "Margaret of Austria, Regent of the Netherlands (1480-1530)." Global Anabaptist Mennonite Encyclopedia Online. December 2007. Web. 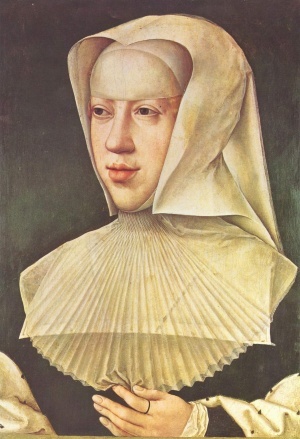 26 Apr 2019. http://gameo.org/index.php?title=Margaret_of_Austria,_Regent_of_the_Netherlands_(1480-1530)&oldid=162716. Zijpp, Nanne van der and Richard D. Thiessen. (December 2007). Margaret of Austria, Regent of the Netherlands (1480-1530). Global Anabaptist Mennonite Encyclopedia Online. Retrieved 26 April 2019, from http://gameo.org/index.php?title=Margaret_of_Austria,_Regent_of_the_Netherlands_(1480-1530)&oldid=162716. Adapted by permission of Herald Press, Harrisonburg, Virginia, from Mennonite Encyclopedia, Vol. 3, pp. 477-478. All rights reserved. This page was last modified on 17 December 2018, at 11:45.